I wanted to share this with you all. My girlfriend and I were on our way home at the end of last week to find a visitor on the main street of the neighborhood. One of the many things I will not miss around here. Some find this so exciting and I find it slightly frightening and overwhelming. When we first spotted; he/she was trying to get into a garbage can that was on the street. It was not a happy cub, yes cub, when it couldn’t get inside. These pictures were taken with my girlfriends phone as we drove past. One of the many reasons why our fur babies Peanut and Reeses are not allowed outside alone to frolic. They make themselves known and they really think they are home. A rather large cub! I would be too frightened to get close enough to take a picture. Oh my gosh! Frightening for sure! This is definitely not something I would want to come home to. Not at all!! They are around a lot! Oh my goodness, Cynthia! He/she is really scary and big! I would never let my fur babies out either! Yikes! Take care! Where we are going they will not have to worry at all! Oh, my! You weren’t kidding when you said you had predators near your home! We used to go camping when I was little and occasionally had to deal with bears. Not fun! I don’t blame you for not wanting to face them in your back yard! It is scary. One time I was on our deck and the leaves made a noise and it was a huge bear with two cubs! Yikes! Oh my word! How scary. Glad you were in the car when you first spotted it! I would be excited and scared all at the same time. My girlfriend gets excited. Me not too much. I have had them walk right up our driveway. Oh my! Hide the honey pot! An unusual but neat experience…a bit hair raising for sure! It is hair raising alright. I have had families of them stroll up the driveway and in my backyard. Oh my Cynthia! That is quite the large cub! Good plan not having the little ones go exploring by themselves! It was a large cub for sure! Thanks, Lynn, that is why it is one thing I really won’t miss! That would scare the HECK out of me. I’m sure I’d do all the wrong things like scream and make it feel threatened, etc. Thank god i don’t have them where I live! I’m SO glad he walked away from you!! It is very scary and when you have two small dogs like we do and we love so much you feel bad they can’t go outside and just be pups. In the new neighborhood they will have a bit more freedom! We went to the Smokey Mountains when I was young and the bears would come up to the cars. They had gotten to used to people feeding them. They looked just like this. We always kept the window up! 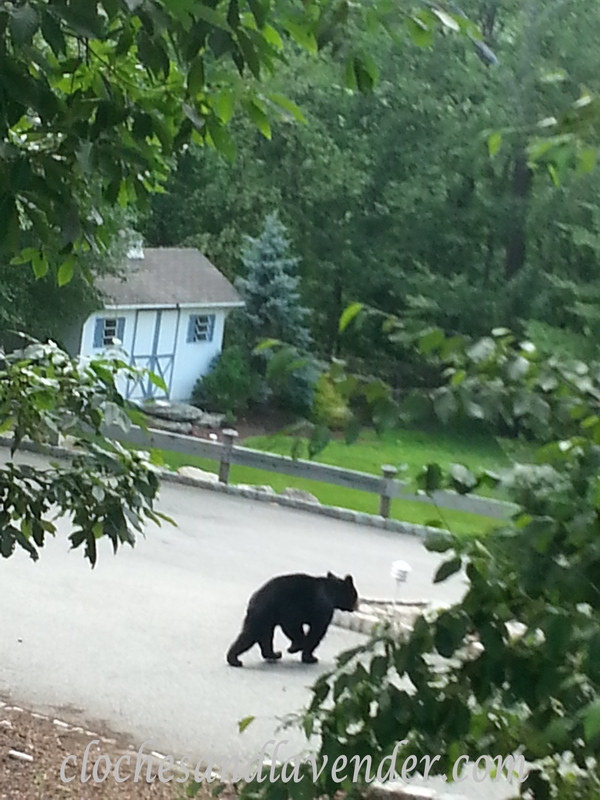 It is quite weird when your are driving or just waking up in the neighborhood and see bear strolling around! I really don’t like it. They just walk around our neighborhood. Not a million but too much for us. Yikes!! How often does this happen? oh my GOODNESS!!!!! We can see why 🙂 keep those pups safe! Thanks for the pictures ~ wow!! Believe me, keeping them safe and happy is our priority!! Are you kidding me? That’s crazy! I was expecting to see a raccoon or something-ha! Not sure what I would do if I saw this…!! We will not miss that at all. We have had them walk up our driveway many times! It is a bit scary and startling. OMG! How scary! 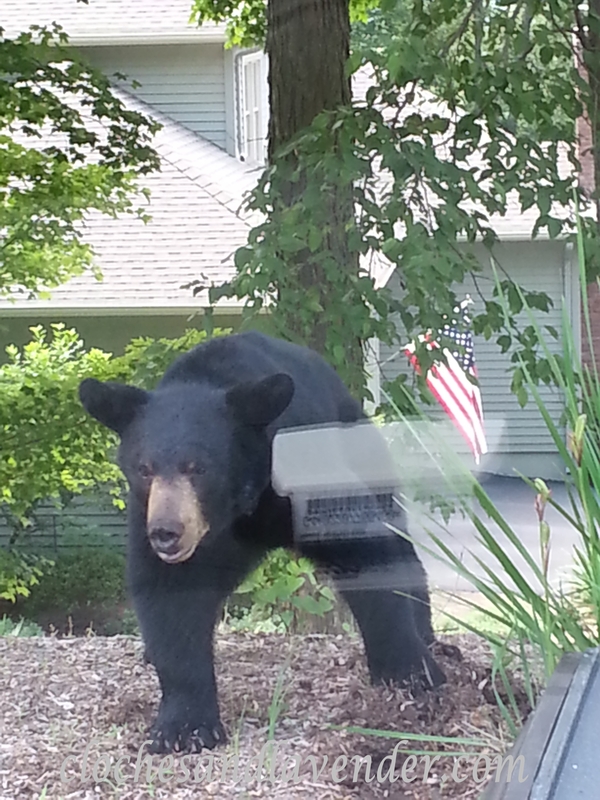 I don’t blame you for not letting your dogs run loose when you have bears at large around you. We have never seen bears around our property, but just tonight I did see a poisonous snake beside our driveway and it scared me to death! I’m petrified of snakes. Now I’m scared for my dog to go out to do his business at night. There has been an increase of snake bites at hospitals this year and snake sightings. It’s been on the news. Mercy me. I guess we all have something to fear that lurks among us. Stay safe! We have snakes up here that poisonous too but we don’t see them much, thank God ! The bear are always lurking around. Wow Cynthia! I hope you were using a zoom lens on your camera! Bears are pretty common at the cabin, and many of the people in the neighborhood have had them on their property and deck. We haven’t had that issue *yet*, but I am sure it’s just a matter of time. They are generally pretty harmless, but it’s best to keep your distance because you never know, especially if they have their cubs with them. I know the mother’s are very protective. We were inches away in the car. It is scary, they just wonder around our neighborhood. Not every day but much more then I care for! I would be petrified, and I’m not sure I would have had the composure to snap any photos at all. Glad you are safe. Bears can be unpredictable or so I’ve heard. They are very unpredictable and I am so over seeing them in the neighborhood. I can’t wait until my biggest problem is rabbits and the occasional deer!! O-M-G!!! That is sooooooo scary! I can’t even imagine having one in my neighborhood let alone in my backyard!!! To think I worry about hawks picking up my babies and you have bears!!!!! I know, but we have hawks and turkey vultures too! So we have so many factors to worry about with them up here. I will be so glad when I don’t have to worry as much and relieved. Thanks for the visit Des. Let me tell you when I say I HATE it, it is an understatement. In the beginning 18 years ago we thought wow but after you see it once it is over. It is scary and I don’t find them cute at all. Where we are going I have to worry about raccoons which I am not a huge fan of and bunnies and the occasional deer. That is much easier to deal with. 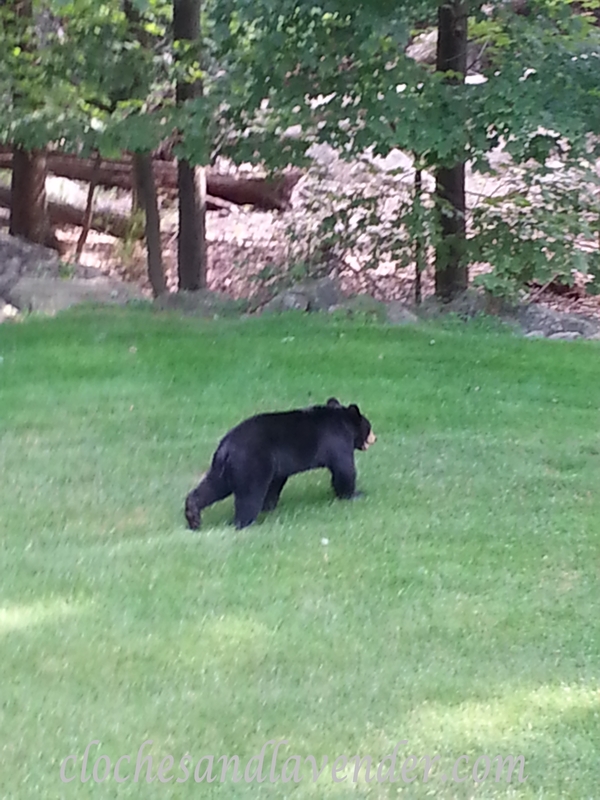 I enjoy watching bears but I don’t think in my own backyard! I can see why you don’t let your pets out to roam! It is quite scary, actually! What a photo! The bear looks too close. I can see why you keep Peanut and Reeses inside. We just had a raccoon visit our house last night. Our dog Maggie chased it out of our garage. Trying to catch it with a Take A Heart Trap. Wish us luck. Thanks, we got very close since we were in the SUV. Too close for me but we did it. Can’t wait to move when our home is done so they can be a little more free. Thanks for the visit! Scary. I wouldn’t miss that either. LOL! Glad you are feeling better!!! Remember take it slow and don’t overdue! A real live bear!!!! Oh, my goodness!!! I thought this only happened on TV and in the movies! But it’s a REAL LIVE BEAR!!!!!!! I would have been FREAKING OUT!!! She got some really good photos, too! Our worries around here are mainly coyotes. There have been a lot more sightings this summer than ever. Not sure why. I’m glad you keep your “babies” close at hand rather than letting them play outdoors unsupervised. A bear in the yard would NOT be a good situation for anybody!!!!!!!! It is so tiring for us. I can’t stand it. In the new house it is rabbits, occasional deer and raccoons, which I don’t like either (just the raccoons). Coyotes are not much fun either they would really scare me too!! They look so cute, but I know that they are not cuddly. lol! Wouldn’t want to get to close that’s for sure! Wow! You got some great pics of that cub. That would be weird to live in an area where bears roam freely. We only get a few stray deer in the yard, although my neighbor said she once saw coyotes cruising through our yard. We did get some great pictures. They wonder around often and after you’ve seen a couple it is not enjoyable anymore. We have coyotes off way, way in the distance. We can hear them once in awhile. Soon it will be just bunnies and the occasional deer. That is easier to deal with for sure! Thanks for the visit Jennifer!! Oh my goodness!…I think I would have passed out in the car or stomped on the gas! !…We have lots of critters around here too…had some bears a couple of weeks ago, but they are gone…the Wildlife Dept said just to leave them alone, “they are just passing through”…in the meantime, you look both ways before going out the door!..Hope the bear was just passing through! They pass through quite often around the neighborhood. We have had enough of them and can’t wait to get the house started in a few weeks and then move in, in 7 months and be done with the animals!! Where are going it is rabbits, deer a bit and the occasional raccoon! Can’t wait to start posting about the build. We hit a little glitch and that will be settled and then full steam ahead!! OMG! ever since I saw the movie “The Edge” with Alec Baldwin and Anthony Hopkins, I have been terrified of bears!!!!!! I would have had a heart attack!!!!!!!! Believe me, it is not my favorite by any means!! I will be happy when we don’t have to worry about this anymore!! Ann, I enjoy your blog very much. You always have something that is inspiring. Well at least where we are building our new home, should start soon, there will only be rabbits, occasional deer and maybe a raccoon!! I can deal with that. Where we are now it is like Jungle Habitat!! Too much for me after 18 years! Thanks so much for the visit, love it when that happens! Oh my goodness! I cannot imagine coming across a bear. I think I might be frozen in my tracks. We see deer, rabbits, squirrels and other woodland animals…..but never bears. Goodness! I wouldn’t find them cute at all! They’re scary. I know your puppies will be happy to be free to go outside and explore and play in your new place! Thanks Manuela for the visit!! I’d be scared too! Glad to see you back! Thanks for stopping by and hanging in there with me. It is very scary! Yes funny! But a little too much excitement, huh? Bears freak me out too. You always leave such nice comments for me. Makes my day! Hope you’re doing well. I am doing well and we are waiting to start our home. The last piece of the puzzle is taking forever for us to get started! You have such a wonderful blog and I get excited when you take the time to visit! Thanks. Thanks for the visit. We are looking forward to not having to deal with this anymore. The pups will have more freedom in the new place. They are small so we have to watch them but at least they will be able to run outside and have plenty of walks with daddy!!! I can’t walk that good from my MS. I hope you used a loooong zoom lense to get that first photo! SCARY!! My girlfriend took it with her phone! I don’t know what I would do if I saw a cub! Grab the camera and then drive as fast as I could …lol. Glad you were able to capture this wonderful creature. I’m sure they look much larger in real life. We have had them knock down our birdfeeders at night but never saw one around here in the daytime! Yikes! We hate it. Where are going to start building our new home they aren’t around. Thank God!!! Thanks for the visit Carlene! I missed this post while I was on vacation! Love your “pet” – good grief!! I live in bear/deer/moose/cougar country so I’m well used to seeing this type of scene, but I’m always surprised to see the wildlife that other bloggers post, especially when they aren’t in the middle of nowhere like I am!!! Ok, the animals you just described SCARED me!!!! Yikes. I thought having deer eat everything in our yard was bad. Oh My Goodness! The bear aren’t fun. That is one thing we really won’t miss around here. Thanks for stopping by. Hi Cynthia, thanks for visiting Petticoat Junktion. I’m glad you found me. I had a great time at Haven. Wish all bloggers could fit it in their schedule. I love your header, so beautiful. I don’t know if you read any of my bio but I would love to go to Haven next year. I have MS and I have trouble walking so my husband is thinking maybe we can make it a road trip out of it and bring our two puppies with us and stay at a pet friendly hotel. If that is an option I have no idea. I would have to do a lot of research. I hope you will follow Cloches and Lavender. I am very excited to see what you are up to next. Love finding new blogs! Now that would be a scary sight and wouldn’t let my pups go out either! Cindy thanks so much for stopping by and I hope you will start following my blog as I did yours!! 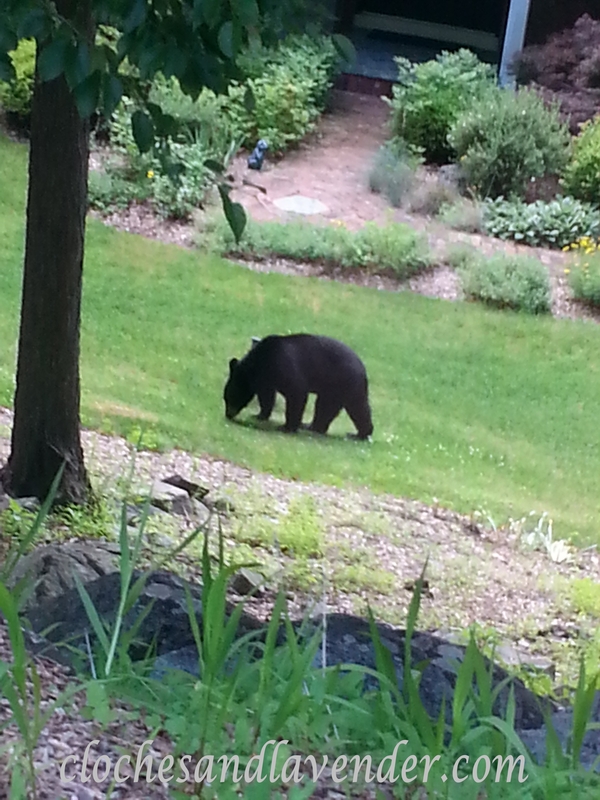 We’ve had several bear cubs (and the mama bear, too) show up in populated places in our town. I guess that’s what happens when we encroach upon their habitat. I’ve not seen any of these bears in person, but when they show up, they stop traffic — sometimes literally. And things almost never turn out well for the bears. Thanks so much for becoming a follower. We are in the process of building a new home. I will be posting all about it and the decorating and choices.